Pachysandra plants are low-growing evergreen perennials used for ground cover in shady places. They grow slowly but surely via a network of underground runners. It makes a thick, dense bed and is the perfect solution to covering ground around tree trunks where sunlight is scarce and mowing difficult. Pachysandra grows up to a foot tall and has attractive, dark green, tooth-edged leaves arranged in whorls. The white-flower spikes that arrive in spring are neither numerous nor conspicuous. White berries that follow are even less noticeable. 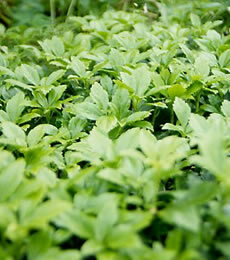 Pachysandra are ideal for all shady areas, for edging and as a border around the house foundation. Plants are deer-resistant.